Is "the card that brings the whole house down." 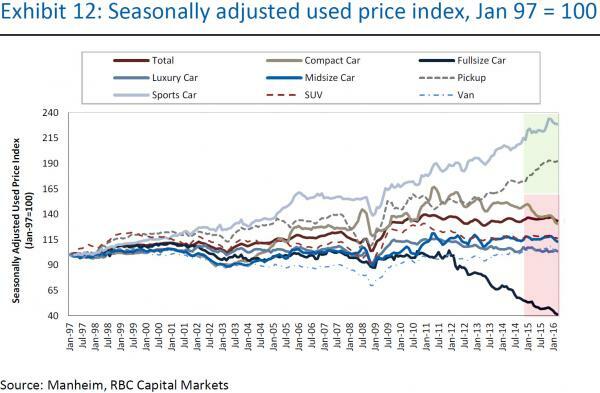 The reason for concern is lower used vehicle prices have a potential spillover effect to many other industry factors. If we think about volume, price, mix, credit – all have been incredibly positive and supportive of the recovery. All are also no doubt related, but that’s what makes it a bit scary. Volume. Higher used vehicle values means higher trade-in value bringing incremental consumers to the new market. Price/Mix. Higher trade-in values allow consumers to “buy” more vehicle. Low rates/term-extension help this too. On mix, greater affordability has pushed consumers into more profitable CUVs or trucks from passenger cars (especially amid low fuel). Putting it all together, it shouldn’t come as a surprise that industry ATPs are up ~15% since 2010.
Credit. High used values lead to lower monthly payments, but perhaps that credit wasn’t as “strong” as lead to believe. For the OEM's captive finance companies, if the vehicle is leased, that lease is written with a higher residual value thereby lowering the monthly payment. As such, we’ve seen leasing mix as a percent of retail sales rise dramatically during the recovery from 17% in 2010 to 29% in 2015. This is another example of letting the consumer get more vehicle than they otherwise can afford. Now let’s think about the unwind. Lower used vehicle values mean lower trade-in value which means lower vehicle affordability. Maybe the consumer is underwater (especially if bought on longer term loans). New volumes could decline if the consumer holds off (or looks to the secondary market). Mix worsens as the consumer affordability is lower. ATPs decline as OEMs incentivize to keep volume and/or mix going. Captive finance companies may write down lease portfolios. In general, monthly payments go higher which raises the credit risk which in turn means auto loan rates could increase which could then stymie demand/mix. Used vehicle pricing is likely to continue to decline as off-lease volume should increase further from 3.1mm in 2016 to 3.6/4mm in 2017/18. 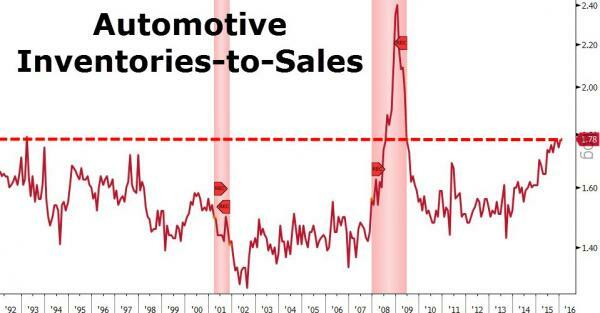 None of this should be a surprise to readers, as we noted previously, Tommy Behnke in Mises Daily predicted that auto prices will fall as the bubble bursts from the artificially created demand generated from excessive credit creation. 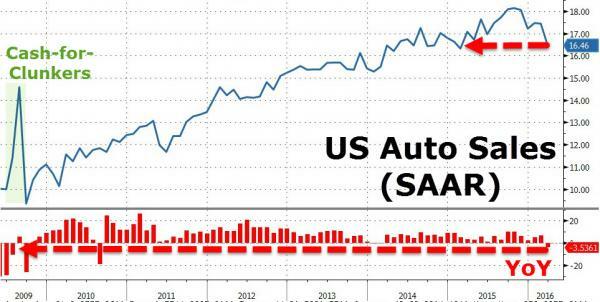 Behnke pointed out that car production has increased a whopping 100 percent since 2009, but that apologists for government’s monetary stimulus programs see this fact as proof of the success of their Keynesian, aggregate demand hypothesis. Behnke, on the other hand, took the Austrian perspective that the government has simply substituted a bubble in subprime auto loans for the bubble in subprime home loans. As defaults rise and automobile loan credit tightens, the result will be the same. 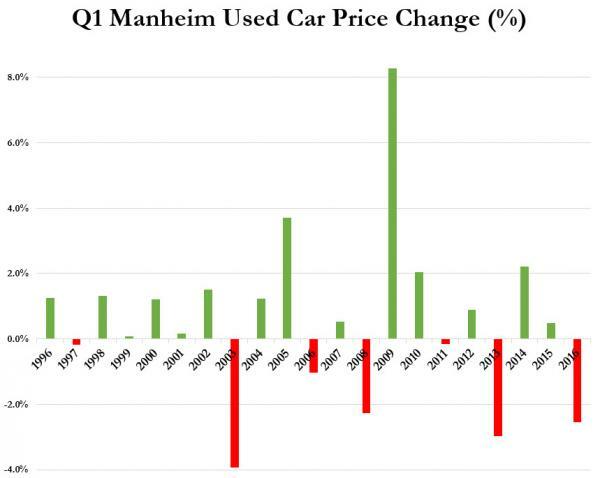 Namely, a flood of used cars, and falling prices. The same happened with homes following the burst of the last bubble: a flood of “used” houses, and falling prices. Surprisingly, the article attracted a number of reader comments predicting that used car prices would not fall, allegedly due to increases in complexity of cars or increases in the difficulty of repairing them. Another suggestion was that large dealers will dominate the used car market and simply raise prices at will. While it’s certainly true that government interference - such as Cash for Clunkers - can raise the prices of cars, it is not true that private dealers (or any other private party) can simply raise the price. More complex and difficult-to-fix cars will not keep prices from falling in an environment in which the inventory of used cars is increasing. Used Car Dealer or Used Car Collector? There is one thing that we can know a priori: that an increase in the supply of some good or a drop in its demand will cause its price to be lower than that which it otherwise would be. There is no other way to clear the market. Mises explained that, eventually, even a monopolist would prefer any price to zero price. Maintaining a price above the market clearing price produces zero revenue. In a flooded used-car market, car dealers must reduce their prices in order to avoid bankruptcy. Otherwise, the used car dealer ceases to be a dealer and becomes a collector. The laws of supply and demand have not been rescinded, even in a world with very expensive-to-build and complex cars. As the automobile bubble bursts, quality used cars will flood the market, creating a buying opportunity for those with cash.